Lax trusses of white flowers tinged purplish-pink and with a strong yellow blotch, opening from pink buds in May. Glossy green foliage, tinged brownish red when young. Open, broadly upright habit. 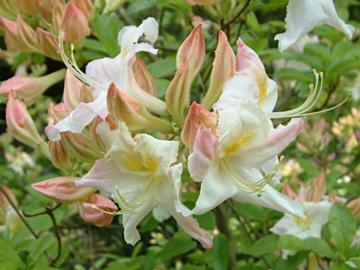 Knap Hill-Exbury hybrid deciduous azalea, raised by Waterer's Nursery.